Rural America, even as it laments its economic weakness, retains vastly disproportionate electoral strength. Rural voters were able to nudge Donald J. Trump to power despite Hillary Clinton’s large margins in cities like New York. In a House of Representatives that structurally disadvantages Democrats because of their tight urban clustering, rural voters helped Republicans hold their cushion. In the Senate, the least populous states are now more overrepresented than ever before. And the growing unity of rural Americans as a voting bloc has converted the rural bias in national politics into a potent Republican advantage. “If you’re talking about a political system that skews rural, that’s not as important if there isn’t a major cleavage between rural and urban voting behavior,” said Frances Lee, a professor of government and politics at the University of Maryland. “But urban and rural voting behavior is so starkly different now so that this has major political consequences for who has power. The Electoral College is just one example of how an increasingly urban country has inherited the political structures of a rural past. Today, states containing just 17 percent of the American population, a historic low, can theoretically elect a Senate majority, Dr. Lee said. The bias also shapes the House of Representatives. 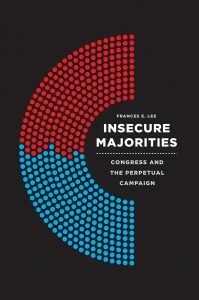 To read more about Insecure Majorities, click here.